Meet Nicole Oneyear. This Iowa native is originally from Dubuque, a city located along the Mississippi River and lies at the junction of three states: Iowa, Illinois, and Wisconsin. Nicole has been a Cyclone for her entire academic career, receiving her bachelor’s, master’s, and PhD degrees from Iowa State University (ISU), with a specialty in civil engineering. 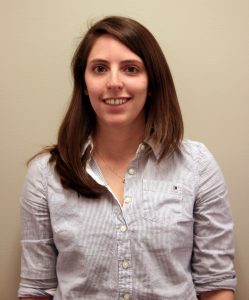 As a student, Nicole was actively involved in the Transportation Student Association, notably president for two years. Additionally, she was involved with the Civil, Construction, and Environmental Engineering Graduate Student Council since 2009, chairing the council for three years. Since graduating in 2015, she became a postdoctoral researcher at the Institute for Transportation (InTrans), where she plans to continuing building on the research she started as a transportation scholar. “The seminar allowed me the opportunity to learn about research happening across the country, especially at other universities in the Midwest. It has also helped me by allowing me to network and meet people that are important within the transportation community. Finally, it has allowed me to work on a variety of research projects other than just my dissertation work. “All of my professors have been great role models while I attempt to conduct research while maintaining a work/life balance,” she said. Taking from their example, Nicole was and remains actively involved in the transportation engineering profession. Her name has appeared in collaboration with nine presentations, three refereed conference proceedings, seven technical reports, and a paper entitled “Evaluation of Driving Behavior on Rural 2-Lane Curves using the SHRP2 Naturalistic Driving Data,” which was recently accepted for publication in an upcoming volume of the Journal of Safety Research.